The modern enterprise often grapples with WiFi issues that can cause connectivity headaches for employees, partners, and customers alike. Companies need solutions that provide sound and reliable technology, analytics, and insights that drive better performance. Yet all too often, network functionality and performance limits opportunity and drives away customers. What are some of the most common WiFi issues facing enterprises today? Poor wireless network design can quickly lead to frustration, connectivity and performance issues. Your network design includes far more than the architecture of hardware and software. It also includes the placement and design of crucial equipment within the physical space. Access points and routers need to be positioned to optimize your network and satisfy users. Optimal positioning involves understanding the impact of objects within the space, too. People, walls, ceilings, desks, filing cabinets, and other big objects can affect your network’s performance. Slow responses on devices are often due to network bottlenecks. Improving quality of service means understanding where these bottlenecks are and what’s causing them. There are many different bottleneck causes — from poor network load balancing to poor network optimization to data-heavy encryption. No matter what the cause, the bottleneck needs to be resolved to prevent user frustration and an adverse impact on productivity. If your locations have equipment that’s emitting radio waves, your network can suffer. Mobile phones, radios, microwaves, MRI machines, routers, and even microwave ovens can lead to poor performance. Denial of Service Attacks. While the more familiar denial-of-service attack involves sending massive amounts of traffic to a network, causing operability issues, networks also face attacks that purposely interfere with operations, such as generating RF interference nearby. Rogue Networks. Bad actors may set up an access point or network nearby in an attempt to fool devices and users into accessing the improper ‘rogue’ network. Configuration Issues. Incorrect network configuration can leave your enterprise exposed to security issues. Passive capturing. An attacker may attempt to get close to your network and “listen in” on activity. The types of applications run on your network can cause system issues. If your organization is using voice and video applications that are mission-critical and time-sensitive, those programs need to be insulated from other network traffic, using detailed, clearly defined and consistently applied quality-of-service policies and guidelines. Enterprise companies have options beyond traditional cables and access points. New technologies allow for virtual network configurations that can add functionality and capacity. However, the cost and integration of these systems, especially in enterprises with both private and public networks, adds more complexity to the network’s design and security. With the many potential issues that can affect network performance and security, enterprises must not only deal with the problems, but also the impact that those problems can have on productivity, financials and brand identity. These consequences can materially impact your operational productivity, customer retention, and efficiency. All of these impacts can adversely affect your bottom line. Here are some of the major consequences of WiFi operability issues. Economic Impact: Whether it’s a file that can’t be downloaded or an application that can’t be accessed, poor or slow service can mean the loss of business. Customers and consumers expect responses, access, and solutions on the spot. Service Demands: When your WiFi isn’t working properly, you’ll incur more help desk requests and tickets. With expectations increasing relentlessly from customers and employees alike, you need a network that meets their needs and reduces the burden on your support staff. Infrastructure Spend: When your network is poorly configured, it’s going to cost your company to find solutions, whether that’s more investment or workarounds. Enterprises need to consider the impact of poor WiFi architecture, performance, and monitoring on their bottom line; without solutions that maximize network capabilities, your network may be holding the organization back from transformative innovation, growth, and customer retention. Your enterprise needs solutions that will identify, analyze, and help correct WiFi issues early on. With Cisco’s Digital Network Architecture (DNA) Center, you will have powerful insights into your network and its performance. With the Cisco DNA Center, you have a clear, easy-to-use dashboard that helps you manage your network. You’re able to design, provision and monitor your network. Automated network management functions let you deploy, connect and lifecycle your infrastructure. At the same time, you can maintain the network’s quality and security. At its heart, Cisco DNA Center is an open platform designed to provide customized solutions. You’ll be able to integrate your network into your IT functions and drive innovation. Management: Your network team has full control from a single dashboard with detailed views of the network, services, and devices. Manage your device lifecycle and import maps and system configurations from other applications. Automation: The solution automatically detects devices and automates quality of service with zero-touch device deployment and drag-and-drop policy creation. Analytics: Gain a deeper understanding of the network and performance with actionable insights based on data on the network’s users, applications, and devices and recommended actions. Security: The product includes threat detection and response tools, analytics of encrypted traffic, and integration with leading monitoring programs. Your network connects everything. Leveraging the network’s capabilities fuels innovation throughout the enterprise. The Cisco DNA Center uses integration APIs that accelerate the exchange of information with third-party IT systems. Connected systems are more deeply integrated with APIs that can publish network data, events and notifications to other systems and consume information from those systems. Intent APIs allow for faster development and deployment of applications that can interact with the network within a single integration layer. Progressive enterprises work to simplify their IT workflows using these APIs to create faster configurations that eliminate tedious and repetitive steps. 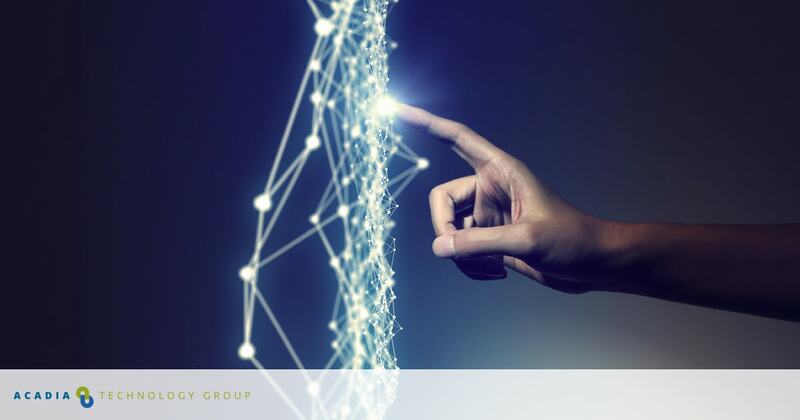 At Acadia Technology Group, we help enterprises develop unique solutions that maximize the impact of wireless networks and other emerging technologies that drive innovation. Partnering with Acadia Technology Group gives your enterprise access to industry-specific expertise that leads to transformation and growth.